This course is designed to provide an introduction to the fundamentals of the new city planning. 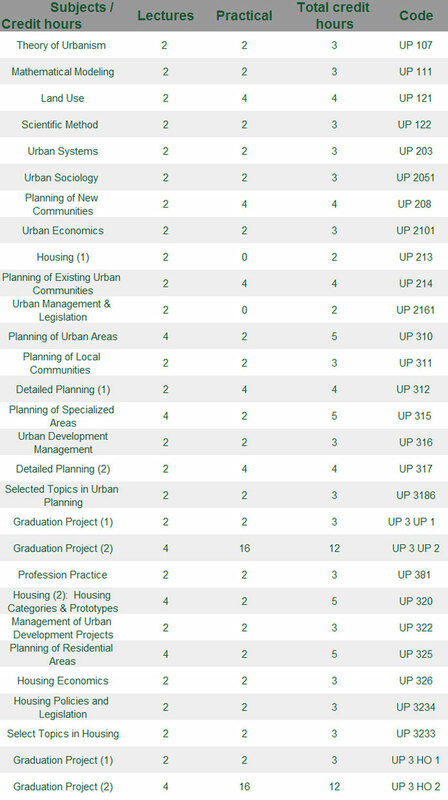 The course is concerned with the multidisciplinary field and practice of new city planning. It includes a review of historical approaches to urban planning and current movements in the field, as well as discussion of the elements of urban form, theories of good city form, scales of urban design, implementation approaches, and challenges and opportunities for the discipline. Learning from cities via fieldwork is an integral part of the course. Each student or group of students selects a new city planning project and goes through the methodology ending by a spatial master plan. This course is a basic subject for undergraduate students. it is designed to provide students with a thorough understanding about housing problems , policies and planning. The first part of the course gives student a general review about the progress of housing policies in Egypt and the implications of these policies on housing problem. The second part discusses the characteristics of different housing social groups with their different needs, requirements in design housing units. The last part provides different housing examples implemented in the new Egyptian cities. This course is designed to provide an introduction to the fundamentals of city planning. The student selects an existing city, visiting its problems by site visit and identifying the local social requirements. In the first part, the course provides the student with the planning methodology steps starting by collecting data, data analysis, problem solving, and presentation methods that are essential for practicing planners. The second part is to teach student how to form the city vision, development scenarios, planning alternatives and spatial master plan. The course uses an innovative teaching model based on community participation in planning of small communities. The course is based on teaching student the following subjects: social planning methods, types of local communities in Egypt, local community characteristics and needs, different planning methods dealing with local community, planning by participation methodology. The student selects a small village, visiting its problems, opportunities and identifying the local social requirements by real participation. The course is a detailed description for housing subjects. It is designed to give student the first steps in design housing areas. The course gives a solid background about the different social groups with their different requirements is design housing units. It also offers different prototypes of housing units and building. The course is also based on a practical exercise to design a housing unit and how it can be assembled in a small cluster. It provides an overview of techniques and specified programs, policies, and strategies that are (and have been) directed at neighborhood design. It gives students an opportunity to reflect on their personal sense of the housing and community development process. The course includes the following: design objectives and principles, social requirements and spatial needs, circulation and parking design, public and private spaces. The course is also based on a practical project for each group of students to design a selected neighborhood in the new cities. The course is mainly designed for undergraduate students registered in the housing path group and an optional course for the planning path group. This course examines the effectiveness and limitations of the law, critical approaches to tenancy law issues, and the synthesis of issues surrounding modern tenancy law. It includes a review for the different national housing laws and regulations launched during the last fifty years and also presents some recommendations for the success of future housing policies.